Valentine's day is right around the corner and so is my niece's birthday. She is turning the big Numero Uno on February 16th. So with helping my sister get an awesome first birthday party together I pulled created an inspiration board. 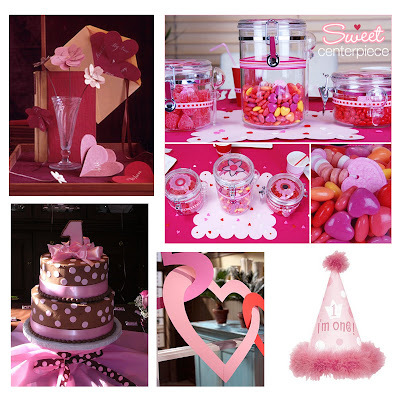 Our theme is Pink and Brown Valentine's Style since the party will be on February 14th. The cake was found at The Wedding Cake I think it is cutest pink and brown cake ever! I hope I can recreate something similar. Hostess with the Mostess has a great idea for table decor: using candies and sweets. From Martha Stewart I found Heart Flowers and Heart Garland which would add inexpensive decor to the party. Above is the invite I created for her party. 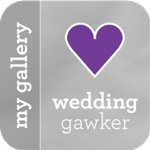 Yes I know my niece's name is not Sarah but I don't want to plaster her name too much on the web! haha. 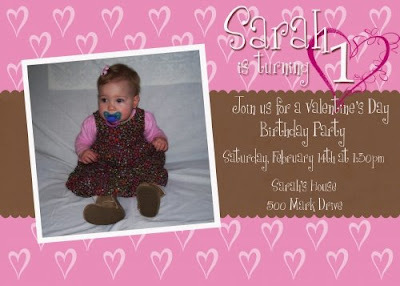 Check out my ArtFire shop if you have a Valentine's Baby and are interested in these invites. They could even be used at any time of the year; what one year old girl would not love a pink heart birthday? can't think of one. CUTE ideas! I love the heart flowers. I want to see pictures of your decorations at the party. my niece has a birthday coming up to. She will be 2 on Feb 6th, and Leah's is on the 11th, and my dad's is the 2nd! We have lots of celebrating in Feb in my family!